The Dodgers left-hander had the luxury of a 3-run lead before he even threw a pitch and a 4-run edge entering the fourth inning but somehow gave it all back in stunning fashion. Los Angeles Dodgers starting pitcher Clayton Kershaw is relieved in the fifth inning against the Houston Astros in Game 5 of the 2017 World Series at Minute Maid Park in Houston, Texas, on October 29, 2017. The Dodgers lost 12-13 to trail 2-3 in the series. Clayton Kershaw's playoff legacy took a big hit on Sunday as he let another possible postseason victory slip from his grasp in a performance that left the Los Angeles Dodgers with their back against the wall in the World Series. Kershaw had a solid chance to finally change the popular perception about him as a dominant regular-season pitcher who could not extend that form into the playoffs but his showing in the Dodgers' Game 5 loss the Houston Astros will only bolster the narrative. The Dodgers left-hander had the luxury of a three-run lead before he even threw a pitch and a four-run edge entering the fourth inning but somehow gave it all back in stunning fashion. Los Angeles may have squandered a number of leads but even after the ace of its rotation left the game with his head down in the fifth inning it did well to battle back before falling 12-13 in 10 innings. "It's a tough one, no doubt about it," said Kershaw, who gave up six runs on four hits. "Everybody did as much as they possibly could to pick me up and it's a testament to our team. Unlike in previous years, the 29-year-old left-hander had been getting better with each playoff round and along the way was silencing the naysayers who for years have blamed him for the Dodgers' early playoff exits. When Kershaw took the mound in the opening game of the World Series, he became the first pitcher in World Series history to strike out 11 or more batters while yielding three or fewer hits without a walk. But on Sunday, with the best-of-seven series tied at two games apiece, the best pitcher of his generation was expected by many to finally clear the few remaining clouds hanging over an otherwise brilliant career. He was solid at the start, facing the minimum nine batters through the first three innings before running into a whole heap of trouble in the fourth. "I just lost my command a little in that fourth inning and that's all it took," said Kershaw, who boasts three Cy Young Awards as the top pitcher in the National League and has been named an All-Star in each of the last seven seasons. It all began with a George Springer walk to lead off the inning. Jose Altuve later hit a one-out single that put runners of first and second. Carlos Correa's double finally put Houston on the board and set the stage for Yuri Gurriel to tie it up. The Cuban first basemen promptly hit a shot to left field that tied the game up at four. When Kershaw came back out for the fifth inning he had a three-run lead thanks to a three-run shot by Dodgers rookie slugger Cody Bellinger but still could not find his command. Kershaw issued a pair of walks and forced the Dodgers to turn to their bullpen way earlier than they had hoped. "He was rolling. He was throwing the ball well, good rhythm. And I don't know, I think that the Gurriel pitch, took a good swing on a pitch and kind of was just left out over," said Dodgers manager Dave Roberts. The series shifts to Los Angeles on Tuesday night (Wednesday morning China time) where the Dodgers, who were the best team in baseball all season, will try to force a decisive seventh game that would be played on the West Coast on Wednesday (Thursday). Kershaw, who acknowledged that he would be available to enter Tuesday's game if the team calls on him, said nothing needed to be said to his teammates about Sunday's loss. "We don't need to talk about it. 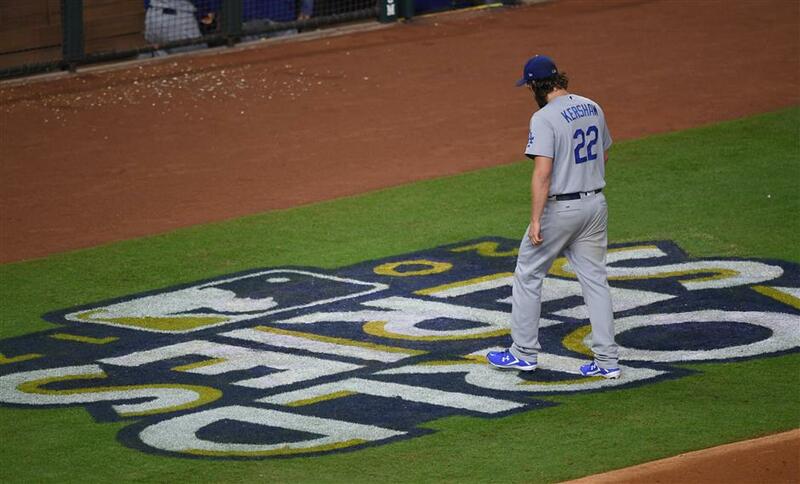 Everybody knows what we need to do," said Kershaw. "It's not a matter of character or effort. This clubhouse has shown time and time again that they can overcome adversity. "Well go back home and get ready for Game 6."